In recent years, web sales for U.S. e-retailers officially exceeded $300 billion, with online sales continuing to grow at a rapid rate. Claiming a larger and larger chunk of total sales, e-commerce is now a critical component of many merchandising and manufacturing businesses. In this article, we will examine the benefits and trade-offs of adopting an e-commerce platform that’s integrated with your ERP software, along with some of the key considerations that should inform your decision. Integrated e-commerce refers to a process allowing your web store and ERP (or back-end accounting system) to communicate directly. Just as there are many ways in which you could ask a friend to dinner, from a text message to an in person invitation, there are also different levels of integration or communication between systems. Integrations can range from a simple, user-initiated import/export process to a fully automated routine with multiple integration points. As the complexity of the integration increases, so does the cost due to the amount of customization required. A standard integration (or pre-built) between two commonly used applications is the cheapest option. But just like a suit purchased off the rack, it may not be the perfect fit for your business requirements. Shopify, Magento, XM and Iciniti are some of the shopping cart or e-commerce applications that offer a standard integration with Sage 300 Order Entry. Most businesses will only begin to consider integrated e-commerce once the challenges of running a standalone webstore become impossible to ignore. A company in the initial stages of establishing an online store with a low volume of sales can manage the duplicate data entry and manual labor required to move web orders into a separate inventory or accounting system for processing. Likewise, businesses with a small number of SKUs and/or fairly static pricing can also manage to keep two systems in sync manually. Delayed Order Processing – manually re-entering order information into an ERP system after orders are placed online is time consuming and increases the total turnaround time for an order. Increased Errors – manual re-keying of orders creates many opportunities for errors in data entry as the information is transferred. As the volume and complexity of orders increases, so does the risk of errors. Webstore and ERP Data Are Out of Sync – since information has to be manually transferred between systems, usually the ERP system will not reflect the most recent inventory or customer information available. If decisions are being made based on reporting from the ERP system, there could be significant consequences for relying on outdated information. Increased Labor Costs – Companies must dedicate significant resources to maintain customers, inventory, item lists and pricing in multiple systems. Over time, slower order processing and more frequent errors will erode customer satisfaction and companies are forced to dedicate greater and greater resources to maintaining items and customers in multiple systems. Cost Savings – the automation afforded by an integrated system eliminates the need for duplicate data entry and greatly reduces the labor and administrative burden of order processing. An integrated system can literally replace positions previously dedicated to data entry and free employees to focus on other areas of the business. Faster Processing and Shipping – orders flow from the webstore to ERP system in real time, eradicating delays characteristic of a non-integrated system. Customers will appreciate expedited service and, depending on direction of the integration, greater visibility if the ERP system updates the webstore with processing and shipping status. More Accurate Data – real time communication between systems means that the ERP system now contains the latest inventory and customer information. Businesses can now rely on the data in their back-end reports knowing that it will be an accurate representation of current information. Increased Customer Satisfaction – manual rekeying of information inevitably leads to data entry errors resulting in orders fulfilled incorrectly. An integrated system greatly reduces potential for human errors in the process and improves order accuracy. Real time update of customer data ensures that address or payment changes are made in a timely manner and that both systems will reflect the correct information. An efficient, error-free ordering process is critical to developing a loyal online customer base. Based on these benefits, it may seem that for the majority of businesses, an integrated e-commerce system is the obvious choice. However, as is usually the case with system design, there are tradeoffs to deciding to integrate e-commerce and ERP. The financial cost of integration is the easiest downside to quantify. The total cost of integration will be influenced by the number of integration points, type (semi-manual vs. fully automated), and whether the integration will be multi-directional (i.e. webstore pushing data to the ERP system and ERP system back to the webstore). Common integration points include customer account data, stock information, item catalogs and price lists. Additionally, many companies use more than one e-commerce platform and would need to consider the cost of integrating multiple systems. Businesses should evaluate things like order volume and frequency of changes in items and pricing when determining whether integration is worthwhile. In many cases, companies may choose to integrate one platform and continue to manage another one manually. A simple, relatively simple and inexpensive integration may include an export file with order information from the webstore that can be manually imported to an ERP system. On the other side of the spectrum, a business may design a custom integration that sends customer, inventory, and pricing information back and forth in real time between multiple e-commerce platforms and the ERP system. Depending on the nature of the business, a complex, multi-directional integration may be required in order to realize any benefit of integrated e-commerce. A custom integration may rely on version-specific features requiring costly programming services to update each time the business upgrades their ERP or web software. Finally, one of the most critical factors in any company’s decision to integrate their web store and ERP system is the resulting impact or limitation on their choice of e-commerce platform. 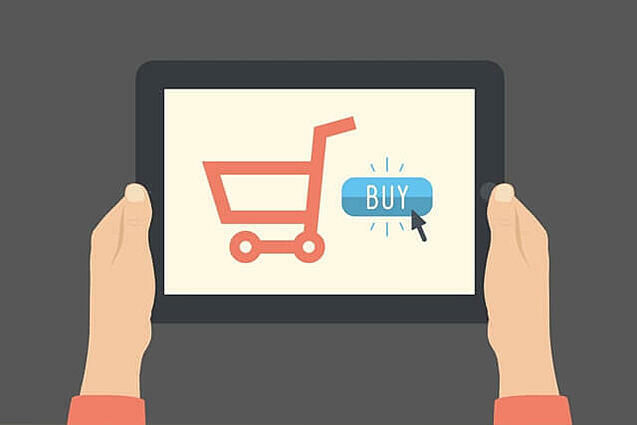 Companies looking to connect a widely-used ERP software application from publishers like Microsoft, Sage, or SAP, with a popular ecommerce platform like Shopify or Magento, are likely to find the best combination of customer-facing web store functionality and options to integrate on the back end. This balance is critical as customers have come to expect a slick online experience and will take their business elsewhere if a webstore fails to deliver. Likewise, a cutting-edge website with an integration that’s unable to create efficiencies or cut costs behind the scenes would ultimately end up hurting the business. The costs of implementing integrated e-commerce and ERP should be continually compared to the benefits that it has to offer. Thus, it is crucial that businesses truly understand their market and online customers in order to find the right balance of features and functionality. Building successful e-commerce integration is time consuming. Businesses must develop a realistic schedule for implementation with ample time for testing to work out any kinks before go-live. With competitor sites merely one Google search away, customers have little patience for “technical difficulties.” When deciding to integrate a web store and back-end accounting system, companies must ensure that they have budgeted adequate resources - both time and money - for a successful implementation. Thus far, this discussion has focused on retail sales, or B2C (Business to Consumer). While B2C often dominates the e-commerce conversation, businesses must also consider their wholesale, or B2B (Business to Business), customers when evaluating integration. Wholesale customers have different needs than retail customers that generate a distinct set of expectations for online purchasing. In the example above, it is clear that the wholesale side of the business would benefit greatly from a multi-directional integration that not only sends stock and pricing information to the webstore, but also updates terms and discounts and other data that may be specific to each individual customer. On the other hand, the retail side of the business could store customer data in the webstore only and may not have a need to integrate any areas other than the inventory and ordering modules. As far as webstore functionality, it is unlikely that wholesale customers would give much consideration to flashy design or other features designed to grab the attention of potential online shoppers, whereas those aspects may be critical to obtaining and expanding retail sales. As in most areas of software system design, integrated e-commerce offers many advantages to those with a sufficient budget and willingness to tolerate some restrictions on webstore functionality in exchange for the efficiency, accuracy, and customer satisfaction that comes from integration. Fortunately, e-commerce integrations are not “one size fits all” and can be scaled to provide the greatest benefit with the fewest trade-offs based on the unique operational requirements of each business. Need to Integrate E-Commerce and ERP? If you think that your company could benefit from integrated e-commerce and ERP, contact the integration experts at Equation Technologies to discuss the best solution for your business and customers.